K MARKS THE EUROPEAN debut of a 20-mm lab-scale extruder coupled with a new underwater pelletizer from Sino-alloy Machinery (Stand 12F36). 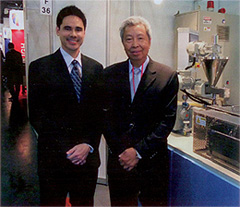 The Taiwanese company has utilized its expertise at its wholly owned compounding subsidiary, polyalloy, to develop a unit that runs so quietly that managing director Mike Chen says he had to put up a sign saying “machine operating.” The clamshell design is typically shipped with an L/D of 40:1 and barrel sections can be added as well as side feeders. Seven lines are already in the field, according to Donald Stephens, Sino-alloy head of international sales and marketing.